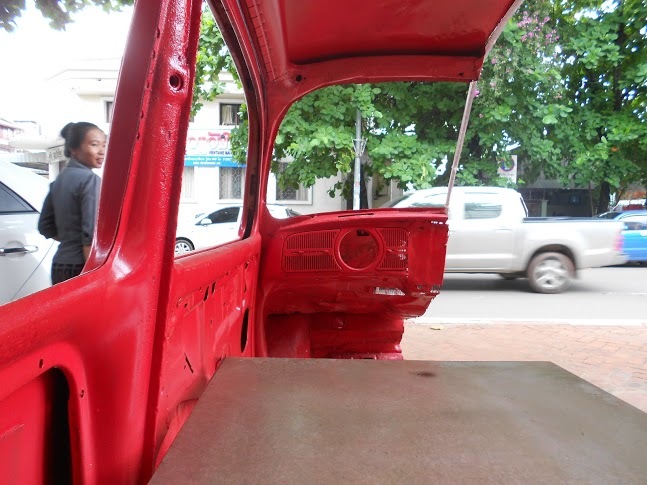 What does a Red Volkswagen Beetle sliced in half have to do with burgers? Well, not much to be honest but it makes for a pretty unique seating option that’s for sure! 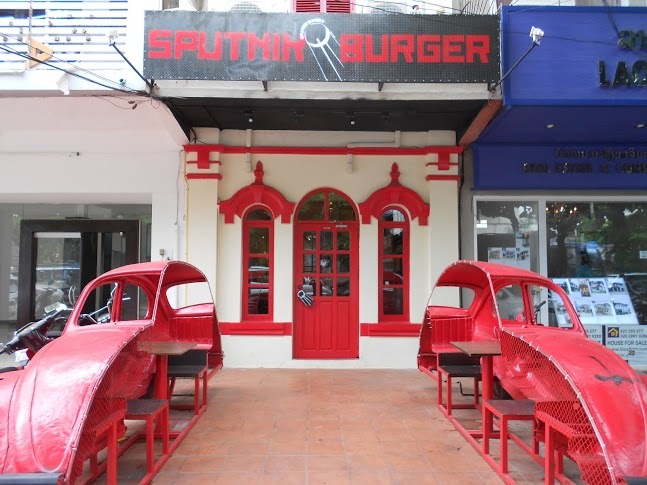 From today, you can now sit in a ‘half beetle booth’ while you watch the world go by and chow down on a pretty sensational gourmet burger at brand spanking new Sputnik Burger along the main strip in town. Venturing into the distinct, eye-catching burger bar for its soft opening, my hungry companions and I were interested to see what a Pimenton and Jazzy Brick collaboration would look like. Not surprisingly Sputnik Burger is destined to be a “surefire success combo” [quoted directly from fellow diner] with its flavour filled, drool-worthy burger menu. The interior is a simple, no frills industrial (space) themed burger bar with edgy, creative pop culture graphics splashed around. Bright red pops out from the mundane whites, greys and blacks in the best way possible, creating a befitting quirky vibe. The layout is suggestive of a revamped old school American diner, with a lively and upbeat atmosphere, in particular thanks to the 80s tunes playing in the background. A projector plays video clips onto a large screen in the outdoor seating area, and although not confirmed will surely be used for burger-movie sessions (!?). In its simplest form, it’s just cool. Select from the standard ‘Sputnik Burger’ (all beef pattie – 45,000 kip) or a ‘Bollywood’ (tandoori chicken – 70,000 kip) or even the ‘Across the Universe’ (veggie pattie made with rice, lentils and onion [yum!] – 70,000 kip) and you won’t be disappointed. At the upper end of the gourmet ‘tastebud enriching’ scale you have the choice of the ‘Mama Mia’ (NZ lamb pattie – 100,000 kip), ‘Stranger in the Night’ (Canadian salmon pattie – 110,000 kip) and ‘The Big Kahuna’ (pan seared foie gras with a grass fed beef pattie – 190,000 kip) to name a few. Yes, if you are on a budget, your wallet may cringe a little, but your tastebuds will be more than satisfied to make up for it. Promise. The burgers come in a clever fold out box*, with proper (read: not sugar laden) fresh, soft buns and a side of real hand cut potato chips with just the perfect touch of salt. Each burger is plentiful with its fillings, and if you aren’t full, you’ll definitely be craving more. Extra sides are available to complement your meal including a house salad (35,000 kip), cobb salad (55,000 kip) and french fries (15,000 kip). The younger burger connoisseur is also catered for with a ‘Mini sputnik’ (25,000 kip). Wash everything down with a soft drink, milkshake, tea/coffee, brew (Beer Lao/Hoegaarden) or selection of wine from Gecko Wines. Sweets are on the menu but weren’t available for the soft opening and include cheese cake, chocolate brownies and smores. Yes, smores! 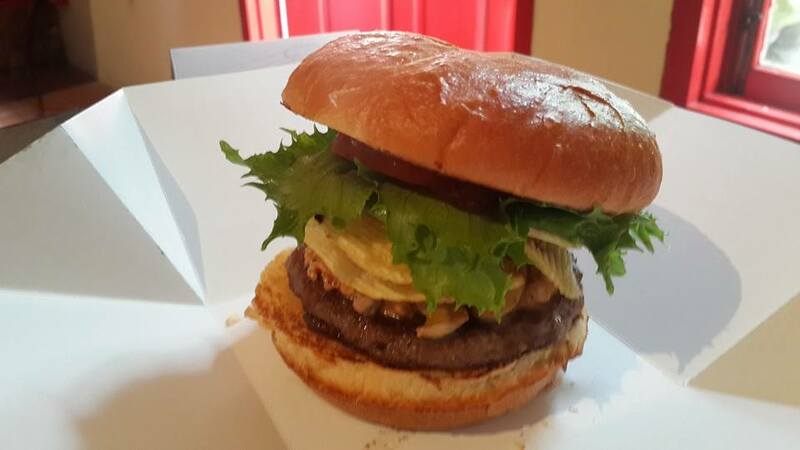 Sputnik Burger is the newest taste sensation in town and while they are not completely out of this world (get it? ), they’re definitely among the stars (still with me?) when it comes to delicious food in Vientiane. Go and check them out! 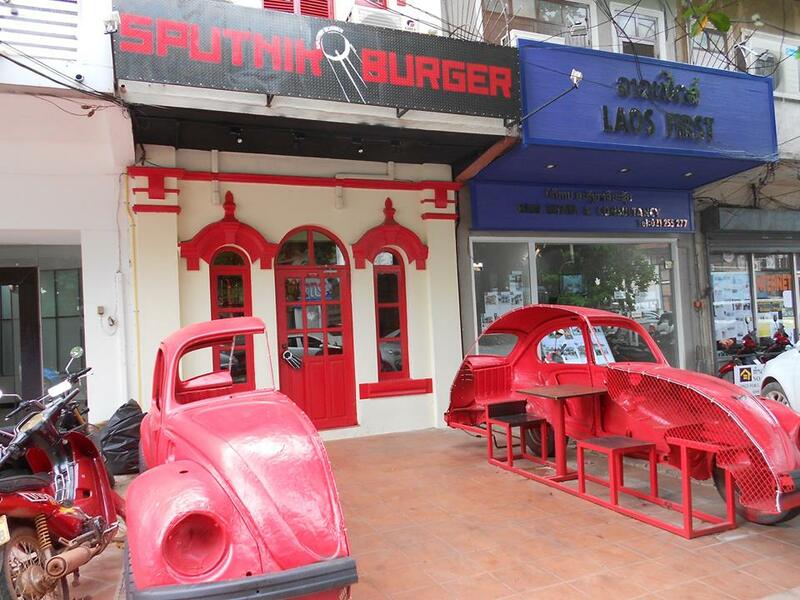 Sputnik Burger is located here on Setthathirath Avenue just down from Jazzy Brick. You can call Sputnik Burger on 03 09376504. The restaurant is open from 11 AM to 11 PM every day except Sundays. *Although the boxes are not very environmentally friendly, they and the plastics used in the diner are being recycled (we asked). 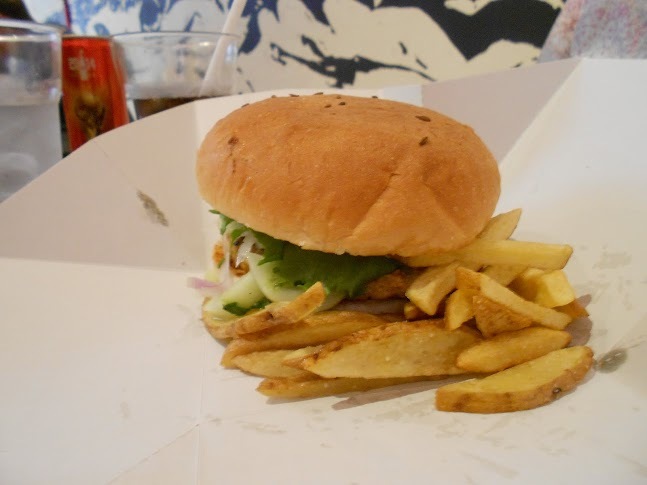 Also check out our previous article on the (other) best burgers in Vientiane. ??????????? ?… ??????????????? ?, ????????????? ??????????????????????????????????????????????????????????? ???? ?????????? ?????????????????????????! ???????????????????????? ‘?????????????-???????? ?’, ??????????????????????????????????????????????? ?????????????????????????????????????????????? ??????????????????????????? “?????????? ???????? ?” ?????????????????????????????????????????????????. ??????????????????????? ?, ????????????????????????????????? ?????????????????????????? ??????????????? ???? ???????????????????????????????????? ??????????????????? ????? ?????????????????? ??????????? ???????????????? ???????? ????????? ??? ???? ??????? ????.? ??????????????????????????????????????????????????? “????????? ???? ??????????????????? ?” [?????????????????????????????] ??????????????? ?, ?????? ?????????????????????????????????????????. ???????????????????????????????????????????????????????????????????????????????? ?, ???????????? ???? ????? ??????????????????????? ???? ????????????????????????????????????????????.? ??????? ??? ?????????????????????????????????????????? “????? ?” ????????????????????????????????????????????????????????????????????????????????????????? 1980s. ??????????????????????????? ???? ?????????????????? ?, ??????????????…????????????????! ?????????????????????????????????????????????????? ????? ‘?????????? ??????? ?’ (??????????????????????? – 45,000 ???) ??? ??? ‘???????? ?’ (?????????????? – 70,000 ???) ?????????????? ‘????????????????????? ?’ (?????????????????????????????? ?, ?????????????? ???? ???????????? [??????????????????????????!] – 70,000 ???) ???????????????????????????. ?????????????????????????????????? ‘???????? ??????????? ?’ ???????????????????????????????????????????? ‘????? ????’(?????????????????? – 100,000 ??? ), ’??????????? ??? ???? ???? ?’ (???????????????????????? – 110,000 ???) ???? ’???? ???? ???????? ?’ (????????????????? ?????????????????????????????????? ???? ???????????????????????? – 190,000 ???) ????? ??????????????????????????????. ?????? ?, ????????????????????????????????????? ?, ????????????????????????????????????????????????????? ?, ?????????????????????????????????????????????. ???????????????! ????????? ?????????????????????????????? *, ???????????? ???? ?? ?, ????????????? ???? ????????????????????????? ??????????????????????????????????. ????????? ?????????????????????????????????????????? ???? ?????????????????. ???????????????????? ?, ??????????????????????????????????. ????????? ?, ?????????????????????????????????????????????????????????????? ??????????? ?????????? (35,000 ??? ), ???? ?????? (55,000 ???) ???? ??????????? (15,000 ???). ???? ????????? ????????? ???????? ‘????? ????????? ?’ (25,000 ???). ??????? ?, ??????????????????????? ?????????????? ???????????? ?, ??/???? ?, ????????/??????????? ??? ?????????????????????????????????????? ????????? ??????. ???????????????? ?, ????????????????????????????????????????????????? ?, ??????????????????????????????????????????????????????????. ??????? ?, ????? ????????? ?, ???????????? ???????? ???? ?????? ???????! ?????????? ????????? ?????????????????????????? ???? ???????????????????????? ?, ???????????????????????????????????????? ?????????????????????????? ?, ?????????????????????????????????. ??????????? ??????????????????????????! ???? ????????????????? ??????????????????????????? ????????????????? ???????? ???? ?????????????. ??????????????????????????. ?? : 03 09376504. ???? 11:00 – 23:00. ??? ????????. * ?????????????? ?, ???????????????????????????????????????????????????????? ?, ???????????? ???? ????????????????????????????????????????. (????????????????????????). The place looks great and very original. It immediately had my attention so as soon as they opened, I went to try a burger. I was not to impressed by the burger, especially for the price paid but since it is a soft opening I would have given them another change. But the reason I will not come back is the price for the water. Pretty much all restaurants in Vientiane serve free drinking water, but Sputnik charged me 10.000 KIP for a small bottle! Let me know when you serve free drinking water or ask reasonable prices and I might come back. I got free water, I just asked and they brought it in a cup. This was our first visit to Sputnik. As cool as the industrial style interior was the reception there. 3 young people, all withe the apple didn’t pay to much attention as we walked in. We where the only guests there. We order a #1 Bürger, a mini Sputnik, a Cobb salad, a small Beer Lao and a coke. The 150000 kip bill came right away followed by the drinks. The burgers and the salad took not much longer. The paperbox is a quite cute idea. The contents just an average Bürger. The Cobb salad came without dressing with watch bit strange. But since we did not get any cuttletyvwith it it did not matter. The worker, owner, co-owner where still busy with their laptops. All in all a bit a disappointment. Average and overpriced food and some arrogant foreigners behind the counter. I certainly will not come back. i will try this place soon!